Throughout history, some books have changed the world. They have transformed the way we see ourselves - and each other. They have inspired debate, dissent, war and revolution. They have enlightened, outraged, provoked and comforted. They have enriched lives - and destroyed them. Now Penguin brings you the works of the great thinkers, pioneers, radicals and visionaries whose ideas shook civilization and helped make us who we are. With its wry portrayal of a shallow, materialistic leisure class' obsessed by clothes, cars, consumer goods and climbing the social ladder, this withering satire on modern capitalism is as pertinent today as when it was written over a century ago. Thorstein Bunde Veblen (1857-1929) was an American economist and sociologist. Educated at Carleton College, Johns Hopkins University and Yale University, his most famous work, The Theory of the Leisure Class (1899), from which this selection is taken, is a satiric look at American society. 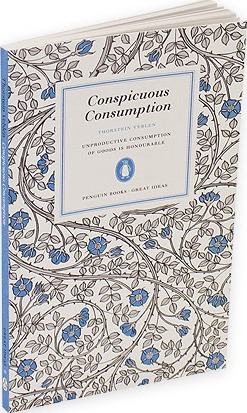 He coined the widely used phrases `conspicuous consumption` and `pecuniary emulation`.